The Fine Art MFA taught programme creates a stimulating and challenging environment for practitioners who wish to push the boundaries of their art practice, to situate their practice in the context of contemporary art and to acknowledge the productive interplay between practice and theory. The potential in this course is ultimately to advance great art work which matters to you and to others. The MFA Fine Art programme is aimed at artists and Fine Art graduates who are interested in advancing their art practices, engaging with contemporary art and theory and considering what art might be in relation to today’s social, cultural and political worlds. The MFA Fine Art is a practice-based course, structured through key pathways of contemporary art such as media, painting, print, sculpture whilst also supporting practices that emerge from transdisciplinary spaces like performance, moving image, archival, text-based and other expanded practices. There is an emphasis on interdisciplinary dialogue and debate while supporting specialized practice in the above areas. Students are encouraged to develop their individual research pathway in finding new ways of making, modelling and connecting their projects to the professional field of the visual arts and wider audiences and situations. The spine of this programme is centred upon an experiential art practice engagement with structured components that explore research methods and contemporary practices. The advanced study required at masters level is informed by contemporary practice based co-ordinates delivered by leading practitioners in the field, including artists, curators, writers and other relevant professionals. The core components of the course are the studios and technical facilities, project spaces, written elements and critical seminars where students present work and reflect on their approach to materials and the theoretical and historical frameworks informing their practices. Through participation in these seminars, regular exhibition opportunities and other events, MFA students develop the ability to test and extend their work in an informed way. The core components of the course are practice-based modules where students reflect critically on how they make work, take a rigorous approach to the materials they use and articulate the theoretical frameworks for their practices. Through participation in regular studio seminars, students work on developing the skills necessary to reflect critically on their work, to test work in new contexts and to present their work to a peer audience. All aspects of being a contemporary artist are developed on the course from making work to mediating it in both verbal, written and other formats. Students maintain a regular system of writing up tutorial reports which form a record of decision-making and reflective writing on their project. In their first year all MFA students take a module in Research Methods which assists them to understand and write about their work as research. In the second year, students can choose from different writing submissions which are supported through Visual Culture modules in art writing and key theories in contemporary art. The MFA features regular opportunities for students to exhibit their work through interim shows and other types of outcomes. Students are encouraged to identify alternative ways and contexts for making work public, to find sites of production and to connect with different audiences. MFA Art in the Contemporary World (with the School of Visual Culture). Students who successfully complete the taught elements of the MA Art in the Contemporary World can proceed on the basis of a suitable portfolio to a second year of studio based study towards a MFA degree. The programme is structured across specialist pathways in painting, fine print, media, sculpture and expanded practices, textiles, ceramics and glass with workshops, resources and technical support provided in these areas. Every student has his or her own studio space working alongside each other in a supportive group environment. Specific research strands can emerge out of the ‘studio–lab’ and lead to productive collaborative projects, exhibitions and events. 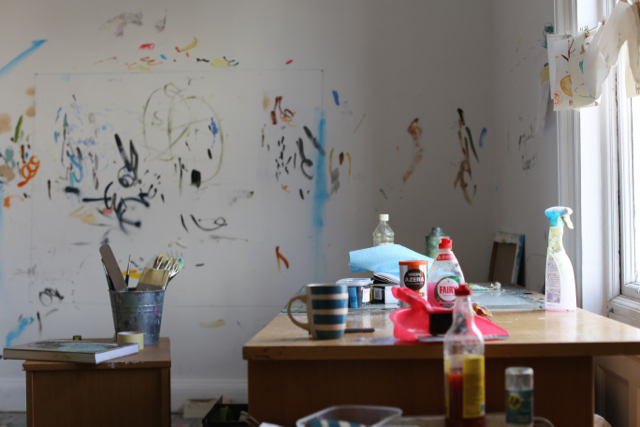 Each MFA student has a personal tutor or supervisor who oversees their progress on the course and also has access to the team of MFA course tutors within the School of Fine Art. The MFA teaching team represent a wide range of practices and research within the field of contemporary art. Where possible visiting lecturers to the programme also work with students. In addition to the core practice and theory modules, students may also choose from elective modules offered by the Schools of Visual Culture, Design and partner courses in UCD. In the first year, second semester, of the MFA, students can travel to a partner college of NCAD under the Erasmus scheme. During the first year students are responsible for developing an interim public outcome which may take the form of a public exhibition or other event. In previous years students have worked with external curators and writers on these events and have exhibited work in different locations and venues. In the second year, first semester of the MFA, students submit a written submission which represents an aspect of their research interests. The MFA is widely recognized as a mark of professional achievement within the artworld and related industries. Our graduates have gone on to build careers as artists, gallerists, curators, writers, lecturers, studio founders and leaders of artist run initiatives. Some have gone on to pursue practice based PhDs. The course has a large body of alumni who are active within the field of contemporary art and the wider culture. All staff across the Fine Art area have national and international profiles in relation to their work. These encompass a wide variety of specialisms and skills across a spectrum of contemporary art practice. The ongoing effort to resource their research, to develop and exhibit work and to be a part of contemporary debate in all its forms, are all understood as critical to contributing to effective and informed teaching.